Apples and pears, fall's finest fruits are now in season. One sign of fall is the arrival of a bounty of apples in local produce stands, along with pears and other fruits. 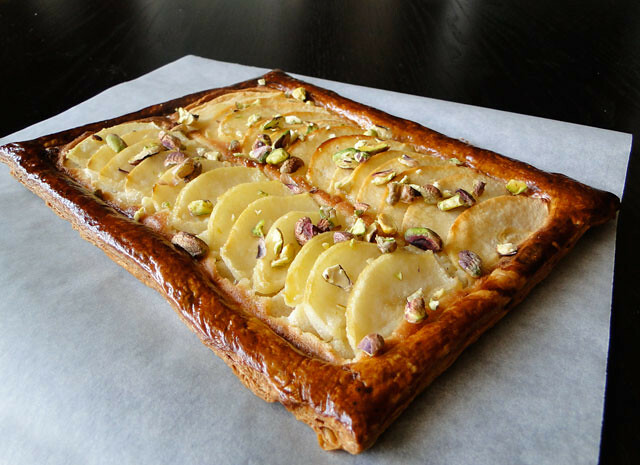 Local farmers' markets are brimming with apples and pears this time of year, and I think this is a very good reason to bake this delicious galette, don't you? Baking fruit gives an exciting taste dimension, it concentrates the fruits' sugars so the flavors are intensified. It also turns flabby fruit to a buttery soft consistency, which is very satisfying. So this month and with the abundance of apples and pears at the market, I decided to take part to the Monthly Mingle hosted by Deeba and send this luscious pear and apple frangipane galette! Frangipane: In the bowl of your electric mixer, or with a hand mixer, cream the sugar and butter. Beat in the egg and vanilla extract until smooth. Add the almond meal and flour and beat until it forms a smooth paste. Transfer to a small bowl, cover and refrigerate. Roll out the puff pastry to a rectangle of 1/4" height. Trim the edges. Score a ½ cm border on all sides with sharp knife. This will enable the sides to rise more than the center. Prick the center all over with a fork and brush the borders with egg yolk. Place on a paper-line baking tray. Top the scored area with the frangipane, then layer the apple and pear slices over the top, brush lightly with melted butter and bake for 30 mn until golden and puffy. Drizzle with honey and sprinkle with pistachios. Frangipane: Dans le bol de votre mixeur, battez le sucre avec le beurre. Ajoutez l'oeuf et l'extrait de vanille et battez jusqu'à ce que le mélange soit crémeux. Ajoutez la poudre d'amande et la farine et battez jusqu'à obtention d'un mélange homogène. Transférez dans un bol, couvrez et mettez au frigo. Sur un plan de travail légèrement fariné, étaler la pâte de manière à former un rectangle. Disposez la pâte sur une plaque de cuisson garnie de papier sulfurisé. Avec la pointe d'un petit couteau d'office, tracez un rectangle interne à environ 1,5 cm des bords sans couper la pâte (cette indentation au couteau créera un léger rebord) et piquez légèrement avec une fourchette. Badigeonnez le bord avec le jaune d'œuf. Etalez la crème d'amandes à l'intérieur du rectangle tracé. Disposez les lamelles de poires et de pommes au-dessus, badigeonnez de beurre fondu et enfournez 30 mn jusqu'à coloration. Arrosez de miel et parsemez de pistaches. Looks so yumm. Pretty pictures as well. That looks delicious and healthy.. Have them in the comfort of your bed using a breakfast in bed tray..
A beautiful tart! So delicious looking. Sounds absolutely delicious and with the frangipane, how intriguing! I love the combination of fruits in this tarte :) Looks very delicious! extra avec cette frangipane ! I luv, luv - this recipe! 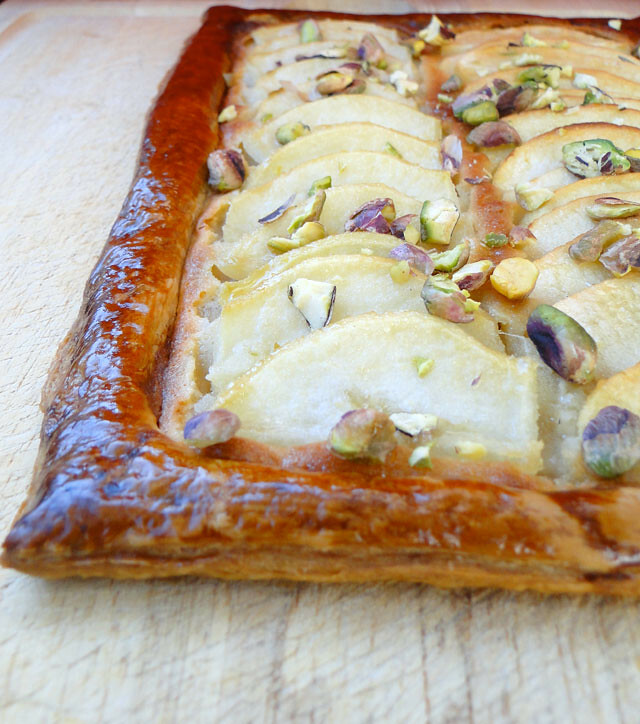 I've been wanting to try an apple frangipane, even have several recipes earmarked - just haven't gotten around to it. This is lovely with the pistachios! Delicious Looking Frangipane. I have to taste this dish. C'est beau. La forme est élégant. Your galette looks gorgeous and I bet it tastes amazing. This tart looks divine! I love all the combination. You've done a great job with it. It sounds like a perefect treat. A very wonderful fall recipe! I am loving the pistachios on there. I have only one word for this...EXCELLENT !!!! galette looks yummy and perfectly done! So beautiful , it looks absolutely yummy and nice! Such a wonderful dessert Cherine ! Your galette looks stunning. I love combination of pears and apples. A gorgeous tart! 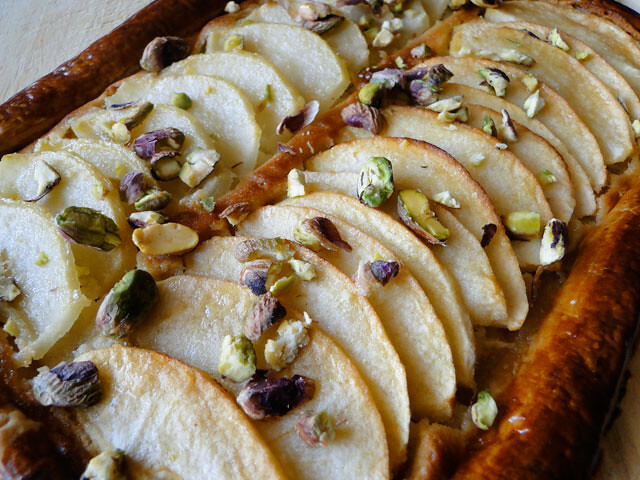 I love the pistachios sprinkled over the top, such a great combo with pears! Wow, an absolutely gorgeous tart! I love everything about it. And it looks so utterly pretty. 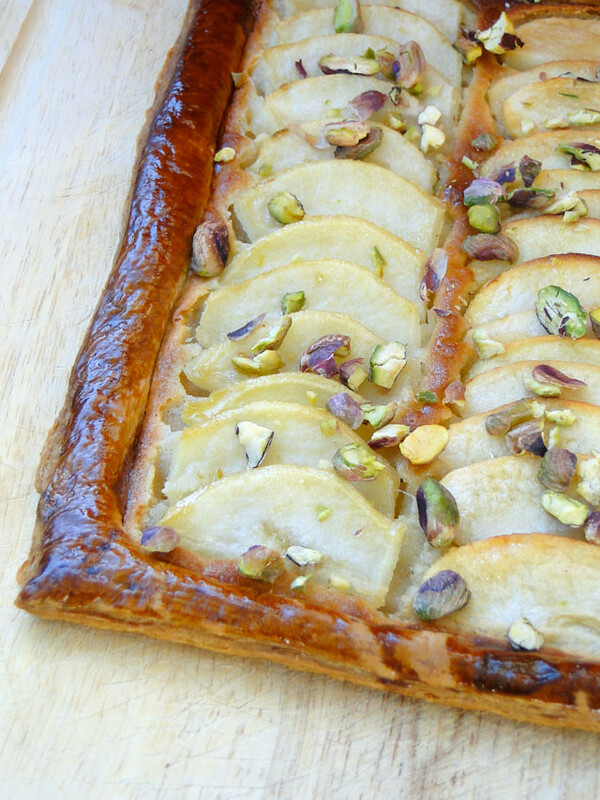 Almonds with apples or pears are always a winner in my book - rather beautiful tart this. I stopped in from Wives with Knifes post about your delightful galette! It sounds as delicious as it is beautiful! Hi! I hopped over from Cathy's blog and into this gorgeous blog of yours. Love the look of this galette so much! Just clicked the link from Wives with Knives and love your blog! This recipe is beautiful and sounds delicious. Thank you for this absolutely luscious and delectable galette. These are one of my favourite pies, rustic and moorish... puff pastry+frangipane+ fruit= WINNER!! Thank you for joining me at the Mingle with this beauty Cherine! I made this tonight and it was delicious! Thanks so much! I made it today with some homemade puff pastry dough... It was fantastic. Super light, perfect ratio of everything, everyone loved it. Thank you!